Hi everyone! 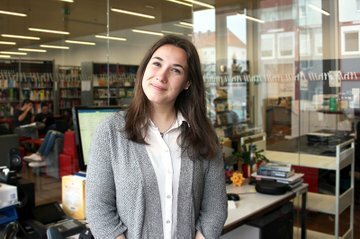 Let me introduce myself before you’ll read about my Austrian experiences: my name is Naomi Melchers and I’m a Dutch student all the way from Rotterdam! I study International Media and Entertainment Management in Breda and follow the English media courses at FH. St. Pölten. If you are interested in the international view of St. Pölten, Vienna, Austria and schnitzel, continue reading! If not, give my blog a try and decide whether or not it was worth it afterwards! The fun times of the intro week have officially ended, it’s time for the ‘’real’’ beginning of the classes. With shock and unbelief I took a look at my schedule, four hours for one class? Back at my home University the maximum amount is two hours because after that you can see the students staring into the distance and wondering what the exact meaning of life is. After spending four hours behind a computer studying the Search Advertising Tool of Google all the students start knocking on the table. For a moment I think that the students have lost their minds and another student sees the confused look plastered on my face. ‘’We don’t clap in our hands after a class, but we knock on the table. It’s an Austrian thing’’. I look him in the eye and repeat ‘’..It’s an Austrian thing..?’’. He nods his head and simultaneously we start knocking on the table at the same time. I wonder if Austrian students have the same reaction when they go to a country that claps instead of knocks. After that thought I, again, wonder how many people have wondered about this. So, this is one of the first differences that I noticed. Nothing big, but it’s funny enough to keep me guessing who was the first person to start this. When I go back home, I might try it at my University. Will people look at me funny? Probably. Will people think it’s funny enough and start doing it too? Highly unlikely. But hey, maybe, just maybe, I’ll be the Dutch girl who started the knock-on-the-table-after-class trend in The Netherlands. Now that’s an achievement that my family, friends and myself can be proud of.